This is an exciting time for us as we first read Amateur Girl back in January 2013. Over the last year we have been busy securing funding, assembling the creative team, booking the tour and undertaking the myriad other tasks it takes to get a show from page to stage and on to the road. We are driven to develop projects and collaborations by engaging stories that need to be told and sincere voices that speak to our audiences. Amateur Girl is such a gem of a play, that tells an important story and is steeped in honesty. We love working with our team, who represent some of the best creative talent regionally and beyond. We're lucky to have Kate Chapman as our director, with Adam McCready on sound design, Eleanor Field on set and costume and Alexandra Stafford on lighting design. 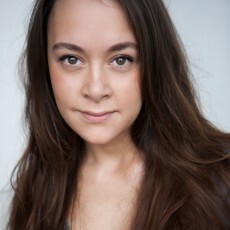 Starring in Amateur Girl is Lucy Speed who is best known for her television roles in Eastenders and The Bill and has a wealth of experience on stage to bring to this role. When we first met Lucy at auditions we knew we'd met 'Julie' and her enthusiasm for this role was palpable. Lucy is reunited with playwright Amanda Whittington's work, having played pregnant singer Queenie in the Soho Theatre production of Be My Baby (2000). Amateur Girl is premiering at Nottingham Playhouse from 3rd – 8th February before embarking on a nation-wide spring tour. All the details can be found on the homepage of our website. The play script of Amateur Girl is being published in line with this tour and is available to buy from each of the venues we visit as well as on Amazon. Amateur Girl would be great for females looking for a strong monologue and audition piece. We hope to see you along at the tour. Here are a few snapshots of the team in rehearsal.